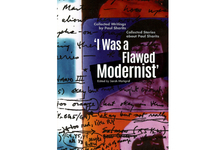 ‘I Was a Flawed Modernist’: Collected Writings of and Stories aboutPaul Sharits, published by the New York Film Makers’ Co-operative, collects all of Sharits’ published writings plus personal correspondence and reminiscences from colleagues, friends and family including Carolee Schneemann, Robert Longo and Tony Conrad (much previously unpublished) in one definitive volume. Sarah Markgraf is Professor of Cinema Studies at Bergen Comunity College in New Jersey. Her writing has appeared in Millennium Film Journal, Afterimage, Film Quarterly, and Metaphor and Symbol.